Has been awhile. Winter was pretty mild, compared to the last two and it looks like it ought to be a great year for Figs! 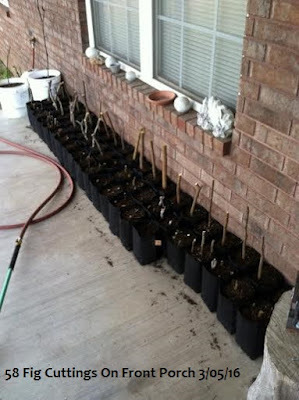 We shuffled ninety-four potted Fig trees and last Fall's rooted cuttings from the garage onto the driveway. Every one looks to be alive with green buds. They were only watered one time, about midway through Winter, from the time we put them in till now. Unknown Lake Spur is the first to throw out a leaf. We have sixty-eight (added ten since photo was taken), gallon size Root Pouch grow bags with various cuttings that were acquired over Winter in trades and some gifted to us. More about these particular grow bags later. Below we have one-hundred eighty-six grow bags overwintered on the back patio, covered with several inches of leaves as their only protection. They were uncovered last weekend and all appear to be fresh as the day they were set into the bags and some with green buds. 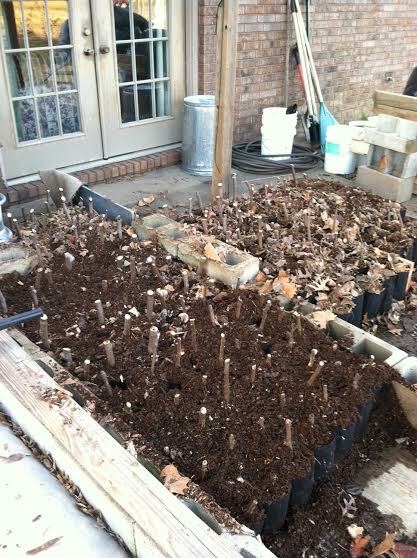 One-hundred Hardy Chicago and fifty Jim Dandy (50% of live plants going back to the owners of mother trees that donated cuttings), along with thirty-six Madelines Green Greek. We'll update on this in a few weeks as they should leaf out soon. 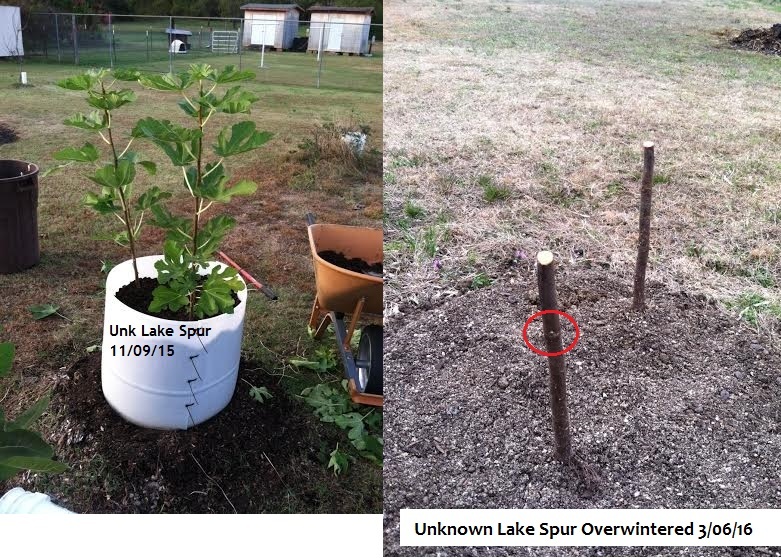 Below we have results of Unk Lake Spur that was left out to overwinter. Only protection was the compost that covered a portion of the two trunks inside the cut barrel. All exposed trunk above the compost was Winter killed as it was mostly green wood, not yet lignified or hardened off. The compost was simply shoveled in and leveled, unpacked and left uncovered. Removing the barrel and raking back the compost to form a permanent raised mound in our now swamp of a back yard, we found green wood and pruned off the dead upper material. There's already a green lateral bud as indicated by the red circle. These plants should bear figs this year. I feel it worthy to mention, there was no mold present on the trunks, even though they were covered with moist compost and top left open to rains. I give credit for this to beneficial microbes in well aerated compost, more below. Promised more about the Root Pouch grow bags used this Spring and over the last few months during Winter. 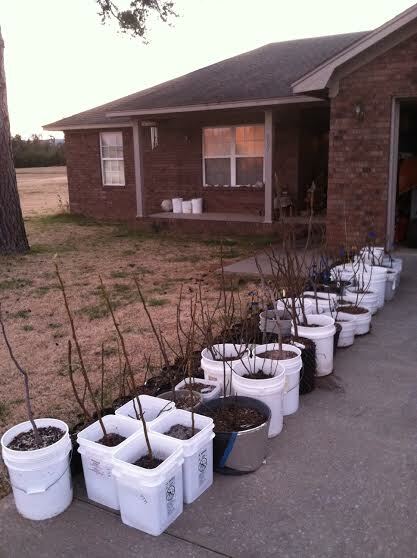 These are the 12-15 month, gallon size from Greenhouse Megastore and cost $0.38 each if purchased in a fifty pack. "Potted plants and trees will enjoy healthy growth while above-ground, and can be planted directly in the ground, where the pot will biodegrade." As mentioned in earlier posts in this blog, Fig roots are very easily rotted during the phase of rooting the cuttings, I believe from a combination of plastic or otherwise non-porous containers, too much moisture, too little aeration and not enough beneficial microbes in the mix to combat the nasties like molds and anaerobic bacteria. 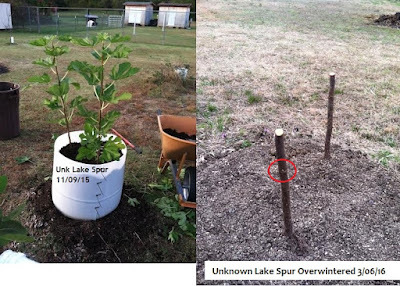 We see the Unk Lake Spur in the above photo. They sprouted from cuttings that were buried horizontally in compost in the Fall of 2014, overwintered outdoors and came to life in a soggy, saturated pile just a few inches above soggy, saturated mud for ground! Try that in a plastic bag or pot or cup or anything indoors and see what happens. It had to be that the compost was aerated and was full of beneficial microbes that allowed the cuttings to root and eventually flourish. They out-grew every other rooted cutting last year far as growth. So, these grow bags just make sense to me, along with the same compost. They should allow the compost to remain aerated which translates to healthy roots and have the added benefit of being able to go right into the ground or container where roots simply penetrate the bag and keep on growing. 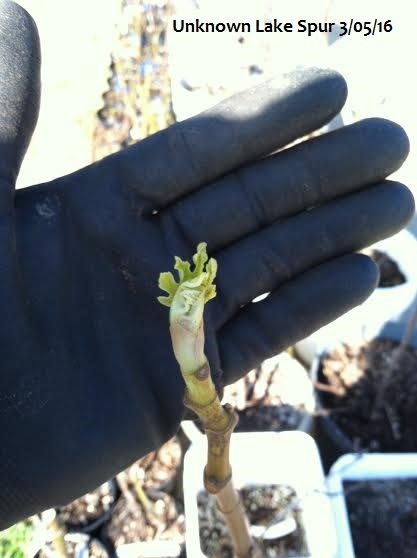 Not ever having to remove the cutting from the bag, often resulting in root shock and delayed growth by transplanting from pots is a big plus in Fig propagation. That's my theory anyway and I'm sticking to it. We'll see if I'm correct when all these cuttings leaf out in a few weeks, or not!